Here we see a photo of the EPCOT model, circa 1978. There are several interesting things to note about the model. First take a look at Future World. Spaceship Earth is not as we know it today. It is an earlier design that featured a smoother surface, and it does not appear to be raised above the landscape. 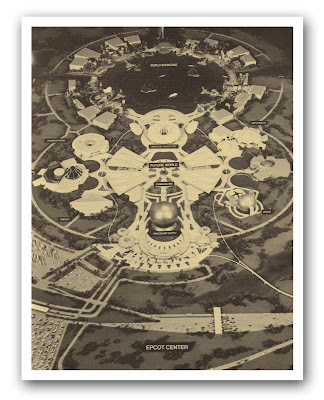 The six Future World pavilions are laid out differently than was finally realized. Notice that The Land is on the east and Space (which will become Horizons) is on the west. Also, The Seas is not in its final place. Further, the Imagination pavillion is not yet on the map, but Life & Health is sitting in its place. Looking into the World Showcase, we quickly see that the American Adventure is front and center on the north side of the lagoon. It is hard to make out much detail on the other pavillions, but if you look at the eastern side of the lagoon, you can see what appears to be the Sydney Opera house, which would suggest plans for an Australia pavillion. The history of Epcot is varied and full of fantastic little facets. This is truly a great piece Craig! I love the models. It is hard to imagine Illumination being done on a smaller WS Lagoon. I have seen other models with the parking to the side. I am glad this was redesigned; otherwise the park looked off balance. Boy...am I glad they removed those gigantic labels before they built the park!